Click the "Edit" menu label at the top of the main window. The Edit menu provides a variety of commands for editing selected items. The available commands will vary depending on the current selection. It also provides commands for undoing most operations, including the snoozing/dismissal of reminders or deletion of items. Note, some operations related to shared or synchronized calendars cannot be undone. This expands into a submenu providing commands for setting a background color or image on the active or selected date(s) in the Month view. A command is also provided for clearing any existing backgrounds. These commands are also available on the Edit menu. For more information, see the Day Background documentation. This command will cause the Search window to be displayed, where you can search for events, tasks, notes, or contacts containing specified text. The search results will be displayed in the List View. The keyboard shortcut is Ctrl+F. 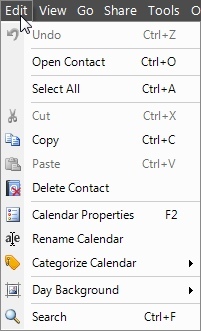 This command will delete the active or selected calendar, category, priority, or location. When deleting a category, priority, or location, any existing events or tasks associated with the deleted item will be updated to remove the association. This will open the Calendar Properties window for the currently active event calendar, where the calendar's properties, such as event defaults and sharing settings, can be viewed or modified. 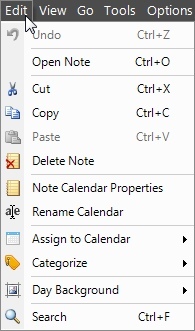 If a note calendar is selected, the Note Calendar Properties window will appear. 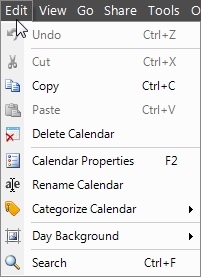 Likewise, if a task calendar is selected, the Task Calendar Properties window will appear. The properties available to note and task calendars are different than the properties for event calendars. To access the properties of a selected category, priority, or location, use the Tools menu instead. This command will enable all events belonging to the calendar to be re-categorized. For example, if you've imported a calendar of birthdays, but all events are set to the "Default" category, you could categorize all events belonging to the imported calendar to the "Birthdays" category by using the "Categorize Calendar" command. After selecting this command, the selected event will open in the Event Editor will display, enabling its properties to be viewed or modified. If the selected event is recurring, you'll have the option of either opening the entire series, or only the selected occurrence. The keyboard shortcut is Ctrl+O. This will cut the event that is currently selected. The event will be removed from the calendar and placed on the clipboard. The keyboard shortcut for cutting is Ctrl+X. This will copy the event that is currently selected. The event will be copied to the clipboard. The keyboard shortcut for copying is Ctrl+C. This will paste the item that was previously cut or copied, into the currently selected date or time slot. The date of the original event is not preserved, but its time of day and duration are. This enables an event to be easily copied and pasted to multiple dates. If there is not an event, task, or note on the clipboard, this menu option will be disabled. The keyboard shortcut for pasting is Ctrl+V. This command will delete the selected event(s). If the selected event is recurring, you'll have the option of either deleting the entire event series, or only the selected occurrence. The keyboard shortcut is the Delete key. 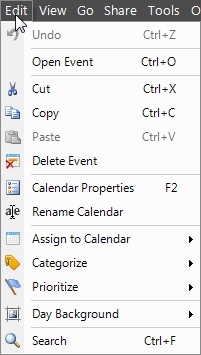 This menu command enables the selected event to be quickly re-assigned to a different calendar. The menu expands into a listing of your defined calendars. To assign the event to a different calendar, click the desired calendar from the list. Selecting a category from this menu will re-associate the event(s) with the selected category. If the event had multiple category associations previously, those will all be removed and replaced with the single selected category. Event categories can also be assigned via the Event Editor. Selecting a priority from this menu will re-associate the event(s) with the selected priority. Event priorities can also be assigned via the Event Editor. After selecting this command, the selected task will open in the Task Editor, enabling its properties to be viewed or modified. This will cut the task that is currently selected. The task will be removed from the calendar and placed on the clipboard. This will copy the task that is currently selected. The task will be copied to the clipboard. The date of the original task is not preserved, but its time of day and duration are. This enables a task to be easily copied and pasted to multiple dates. This command will delete the selected task(s). Selecting a category from this menu will re-associate the task(s) with the selected category. If the task had multiple category associations previously, those will all be removed and replaced with the single selected category. Task categories can also be assigned via the Task Editor. Selecting a priority from this menu will re-associate the task(s) with the selected priority. Task priorities can also be assigned via the Task Editor. This command expands into a submenu where the current percent completion can be selected, in 10% increments. If the percent completion is set to a value greater than 0% and less than 100%, and the current status is "Not Started", the task status will be moved to "Started". If the percent completion is set to 100%, the task will be marked completed. The percent completion can also be set in the Task Editor. This command expands into a submenu where the task status can be changed. Status values can be Not Started, In Progress, Waiting, Deferred, or Completed. If the status is changed to Not Started, the percent completion will be moved to 0%. If the status is changed to Completed, the percent completion will be moved to 100%. The current status can also be set in the Task Editor. After selecting this command, the selected note will open in the Note Editor, enabling its text to be viewed or modified. This will cut the note that is currently selected. The task will be removed from the calendar and placed on the clipboard. This will copy the note that is currently selected. The task will be copied to the clipboard. The pinned date for a note is not preserved. Pasted notes will be pinned to the selected date. This command will delete the selected note(s). After selecting this command, the selected contact will open in the Contact Editor, enabling the contact details to be viewed or modified. This command will delete the selected contact(s).